The father of the Chelsea and former England captain John Terry has been given a suspended prison sentence after pleading guilty to dealing cocaine. Edward Terry was given a suspended term of six months after he admitted supplying the class A drug. Basildon Crown Court heard Terry, 56, from Chafford Hundred, Essex, supplied it to a News of the World reporter in a wine bar in 2009. Judge Christopher Mitchell said it was a very clear case of entrapment. Terry was also ordered to carry out 100 hours of community service and pay £95 costs. A News of the World spokesman denied it was entrapment and criticised the sentencing as lenient. The court was told Terry had supplied drugs to reporter Dan Sanderson, posing as a chauffeur, and had been paid a total of £160. Sentencing, Judge Mitchell said: "It is a very, very clear case of entrapment solely to create a newspaper story." 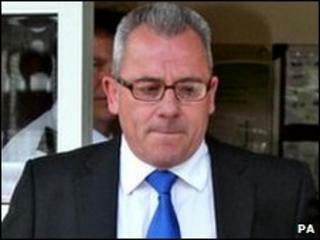 The court heard Mr Sanderson befriended Terry at the wine bar over a six-week period last autumn. Prosecutor Paul Scothern said: "Employees of a national newspaper decided to mount what was in effect a sting operation against Mr Terry to ascertain whether he could or would supply class A drugs." On 5 November, Mr Sanderson went to the bar with two of his colleagues, whom he claimed were his "multi-millionaire" boss and his boss's friend. Chatting to Terry and others in the bar in a conversation he was recording, the journalist said he had to entertain the two men, who wanted to visit a lap-dancing venue. He said he wanted to obtain some cocaine for the men and asked Terry if knew where he could source the drug, the court heard. Terry suggested two people, but the reporter was not satisfied. Mr Scothern told the court: "Then Terry said, 'I can supply. How much do you want?'." Terry left the bar and returned about 15 minutes later with the cocaine and the deal was done in the men's toilets, Mr Scothern said. Lawyer Neil Saunders, defending, described it as a "highly unusual, if not quite exceptional sort of case". The court heard the subterfuge extended to Mr Sanderson driving an S-Class Mercedes and ordering the most expensive brandy and a bottle of Dom Perignon champagne. Mr Sanderson was told by his editor to make sure Terry handed over the drug, rather than the person delivering it, the court heard. A spokesman for the paper said: "This disgracefully lenient sentence is a green light to dealers". Mr Saunders said of Terry: "He is said to be full of remorse and is embarrassed and ashamed his actions have brought the publicity on his son that they have."